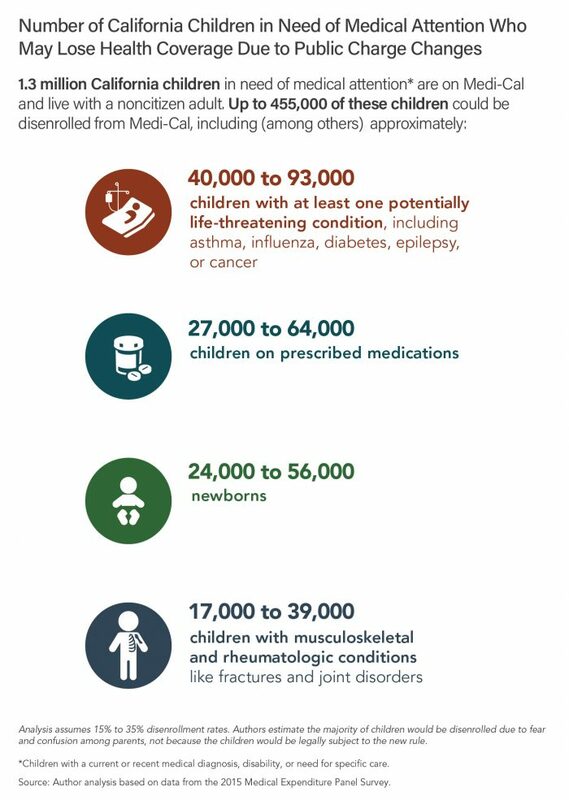 New research from the Institute for Community Health estimates that the Trump administration’s proposed changes to the public charge rule could prompt 195,000 to 455,000 California children in need of medical attention to leave Medi-Cal. This estimate includes up to 93,000 low- and moderate-income children with at least one potentially life-threatening condition, such as cancer or epilepsy, and up to 56,000 newborns. Once disenrolled, they are likely to become uninsured, increasing their risk of going without care or experiencing delays in obtaining services they need. On October 10, 2018, the Trump administration published a proposed rule change (PDF) in the Federal Register that would increase the likelihood of an immigrant being determined to be a public charge, resulting in the denial of an application for legal permanent residency or entry to the US. The proposed rule instructs immigration officials reviewing applications to consider a broadened array of public benefits — including health and nutrition programs such as Medicaid and the Supplemental Nutrition Assistance Program (SNAP) — along with other factors that would disadvantage low- and moderate-income applicants. The proposed changes are expected to cause large numbers of immigrant parents to disenroll themselves and their children from safety-net programs, in large part due to fear and confusion over the rule. This is the case even within immigrant families to whom the rule does not apply. This phenomenon is referred to as the “chilling effect,” and there have been reports that this is already occurring. For our new estimate, we used a previously published methodology (PDF) and analyzed the most recent data available, the 2015 Medical Expenditure Panel Survey (MEPS), to assess the number and health of children insured by Medi-Cal living with at least one noncitizen adult. (See our October 23 article for more information on the methodology.) We defined “children in need of medical attention” as children with a current or recent medical diagnosis, disability, or need for specific care. Children are at risk of disenrollment from Medi-Cal either because the rule directly applies to them or, more likely, because of the chilling effect. These coverage losses would harm children in need of medical attention and would likely contribute to poor health outcomes in the future. In contrast, providing health care and benefits helps children stay healthy, do better in school, and minimize poor health in adulthood — all of which benefits the US economy and society over the long term. The public comment period for the rule ends on December 10, 2018, after which the Department of Homeland Security must consider comments before issuing a final rule. The research reported in this article was conducted at and with the support of the Agency for Healthcare Research and Quality (AHRQ) Center for Financing, Access and Cost Trends (CFACT). The results and conclusions are those of the authors and do not indicate concurrence by AHRQ or the Department of Health and Human Services. Dr. Leah Zallman is director of research at the Institute for Community Health in Malden, Massachusetts, a primary care physician at Cambridge Health Alliance in Cambridge, Massachusetts, and an assistant professor of medicine at Harvard Medical School. Her work has appeared in Health Affairs and the Journal of General Internal Medicine and has been the subject of reporting in the New York Times, Washington Post, and Los Angeles Times. Dr. Karen Finnegan is an epidemiologist at the Institute for Community Health.